Swift: As mentioned at the top, this month’s rankings had a minor issue. At the request of a few parties ahead of Apple’s WWDC, we went to take a look at the rankings to determine how Swift had performed given its meteoric rise from #68 to #22. Unfortunately, due to a change in page structure, our automated Stack Overflow scrape had failed. So we narrowed the scope, did a quick manual lookup of the Stack Overflow numbers for the Top 30 from the prior run, and calculated out rankings just for that subset. For this partial run, we had a 3-way tie for 18th place and then Lua and Swift tied for 21, leaving Swift just outside the Top 20. For our official rankings, however, we obviously required a complete set of Stack Overflow data, so we collected a full run shortly after WWDC. The partial results from our June 1st run were of course discarded so as to compare all languages on an even footing. When we ran the full rankings then, with the new, complete Stack Overflow set we discovered something interesting: Swift had jumped from #21 to #18. Call it the WWDC effect, but Stack Overflow in particular surged as is evident from the chart and pushed Swift up just enough to displace the 19th place finishers. This means that it’s last three rankings in order are 68, 22 and 18. While we caution against reading too much into the actual numerical placement, Swift is certainly the first language to crack the Top 20 in a year. By comparison, one of the fastest moving non-Swift languages, Go, ranked #32 in the original 2010 dataset finally cracking the Top 20 in January of this year. Even if you assign little importance to the actual ranking, then, there is no debate that Swift is growing faster than anything else we track. The forthcoming release of Swift as open source and availability of builds for Linux, as well, should theoretically provide even more momentum going forward. Nimrod should be Nim. Also, can you post your rankings for language above 20? Also, how do you determine rankings for languages far outside the midline (VimL, SQL, etc). Do you sweep a straight diagonal line from upper-right to lower-left? @Joel: Thanks for the correction. We’re still working off of the GitHub and Stack Overflow classifications which are Nimrod, but I’ll try and remember to correct that next run. As for the downstream numerical rankings, we don’t make those available mostly because the further you go down, the less relevant the numerical ranking is due to lack of sample size. The difference between #95 and #96, for example, could be a few Stack Overflow tags which is meaningless. We include them on the plot, however, because it can be interesting to see how they perform not so much one language to another as much as on GitHub vs Stack Overflow. Interesting listing overall. I am not sure what you mean by categorizing Scala as “specifically purposed”. It is a general purpose language that runs on the JVM and is about as versatile as Java in most of the ways that count. It has, lately, become heavily associated with Spark, but if anything, this should drive additional adoption given Spark’s momentum. Use of Scala tends to be driven by a particular need more so than some of the languages in the Top 10. But you’re right to point out that Scala is, certainly relative to R which it was grouped with, general purpose. Css a programming language? Hmmmmmm…. It might be useful to normalize the github popularity index. It seems unfair to penalize concise, expressive languages by just counting raw number of lines of code. If a relative verbosity coefficient could be arrived at (say, relative to Java), then the raw popularity index could be divided by this to more fairly rank languages on this axis. With Clojure, for example, if 0.4 was used as the verbosity coefficient, the weighted github index would be (actual index)/0.4. Clearly more expressive languages would get a boost, as they should. @sogrady – You can delete/moderate this comment, I’m just giving you feedback on my experience using this comment section on my iOS device. As I was filling out the form I found it near-impossible to click on the green Publish button. Just FYI. My setup: iOS 8.4 (6+) using Twitter client. Shorter comments (fewer lines) seems to work ok. This commented was entered using my desktop but would otherwise be impossible using my phone. How does this ranking take into account languages like ClojureScript? Do you fold those numbers in with Clojure or are they counted separately? I strongly suspect that the TeX and Emacs statistics are heavily skewed by them having their own independent fora in the Stack Exchange network. So what happened to the Cb (C-flat) language, surely that is now somewhere high up there? Despite your artificial reasons, I think it’s silly to group Julia and Rust together. These languages are very, very different. I am surprised that there is no mention of APL. Go o TryAPL.org and take a look and try it. Today one can speak of Dyalog APL as a multi-platform programming language that incorporates procedural, functional, and object oriented paradigms.The development of true parallel processing is underway. It would be great to see an analysis based on total lines of code, not total projects for which the given language had the most lines of code. I’d also be interested to see an analysis of “language activity rates”: Total lines of code added/changed in the last 6 months in commits to files with extensions related to each language. 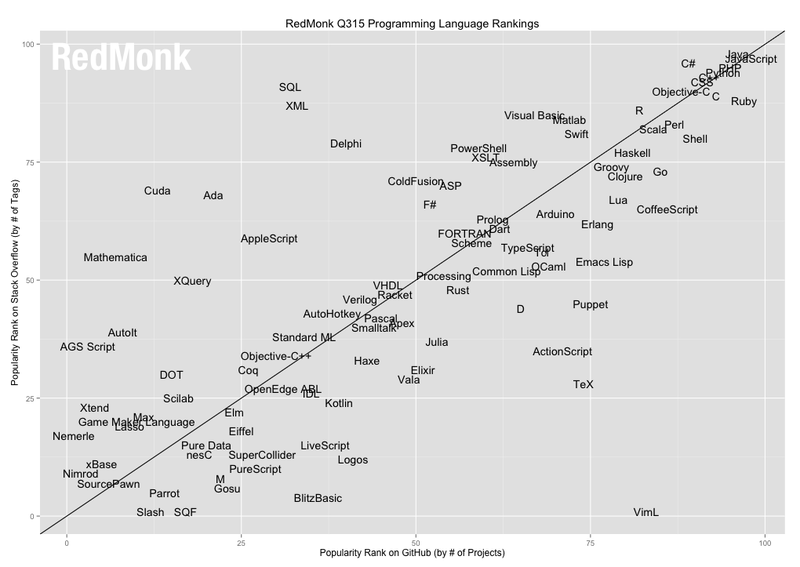 @Luke – it would seem a ranking based on total lines of code would inflate rankings for more “verbose” languages. 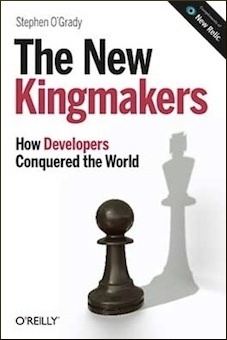 Not that it was necessarily more popular, just that people bled more to code in that particular language. Ranking is defined by GitHub -based on how many peoples using GitHub by language wise(index)..
so it is not Top language ranking real world(software). so many repositories are using so many technologies… etc(SVN,CVS..et). I can’t see OpenCL on the graph. Given that CUDA is, perhaps it should be?